While we are all being conned into watching helplessly as the TSA sexual assaults men, women, and children, the FDA is busy doing the UN’s job of implementing Codex Alimentarius with the first step being the destruction of the nutritional supplement industry that is keeping Americans alive even though our pathetically inadequate nutritional level food is starving us. THAT will be coming to an end…or we’ll just have to cut the purse strings to the FDA (along with the rest of the alphabet agencies). (NaturalNews) Yesterday we reported on the FDA’s new scheme for outlawing nearly all nutritional supplements formulated after October, 1994 (http://www.naturalnews.com/032912_F…). That was just the beginning of this story, because a detailed analysis of the proposed new regulation reveals extremely disturbing revelations that would absolutely gut the nutritional products industry if these regulations are put into practice. • All supplement companies must REMOVE their products from “interstate commerce” for the 75 days after the FDA receives their NDI applications. No product containing an NDI application ingredient may be sold in the United States or it will be considered “adulterated” by the FDA and thereby subjected to confiscation. • While the NDI provisions of the 1994 DSHEA act merely required dietary supplement companies to notify the FDA of new ingredients, the FDA is now distorting this into a de facto supplement approval process. Without the FDA’s new approval, nutritional supplements will all be labeled “adulterated” and potentially confiscated at gunpoint by the FDA (see FDA raid links below). • The FDA does not support electronic filing for NDI applications. All applications must be done on paper and then mailed to the FDA (yes, as in dropped in a metal mailbox with a paper envelope). The 75 days of waiting does not begin until the FDA says it receives your application. • While a few ingredients that were in widespread use before 1994 are exempted from these new requirements, the FDA refuses to publish any list of “grandfathered” ingredients. Instead, it requires each supplement company to figure it out for themselves. In addition, even pre-1994 ingredients must receive new approvals from the FDA if they are “altered” in any way, including changing the particle size, increasing the amount per serving, using a super-critical extraction process, baking the substance or even harvesting it from a plant at a different life stage of the plant. In other words, nearly all ingredients use in dietary supplements today are considered “adulterated” by the FDA. • As a result of the point above, nearly all dietary ingredients will be required to receive new approval by the FDA due to the agency’s broad definition of “adulterated.” Note that changing the mg per serving of the nutrient makes it “adulterated,” as does altering the target market. So if you sell vitamin C to senior citizens, and it’s approved by the FDA as a dietary ingredient, you will need a NEW application and approval if you now sell that same vitamin C to children. • The FDA has no obligation to “approve” any NDIs in a timely manner. It merely says it will acknowledge receipt of the NDI application within 75 days. • If one company receives approval for a specific dietary ingredient (resveratrol, for example), that approval does NOT apply to any other company. EVERY company must independently apply for approval of resveratrol, and each company must independently supply all the research and documentation required to support the safety and efficacy of that ingredient in the amounts used in its products, and in the context of the marketing of that product. • Companies that sell dietary supplements containing ingredients that have not been approved under these new FDA regulations will be accused of selling “adulterated” ingredients and can have their inventory seized by federal marshals or have their company founders arrested for selling “adulterated drugs” even though they might only be vitamins or herbs. • The real kicker in all this? Synthetic molecules that mimic dietary supplements (i.e. those used in pharmaceuticals) are EXEMPTED from all these requirements! So synthetic molecules need no approval from the FDA, while the natural ones do! This conveniently exempts the pharmaceutical vitamin companies who use synthetic vitamin chemicals rather than natural, full-spectrum nutrients. Remember, the FDA will receive hundreds of thousands of these applications if it adopts this regulation. Under that mountain of paperwork, guess what we’ll see next? The FDA begging Congress for “more money” to handle the work load! Notice that nearly ALL ingredients lead to the conclusion of “NDI notification required.” And even for those ingredients that the FDA says don’t require notification, it recommends voluntary notification (bottom right corner of the chart). Note carefully, too, that merely altering the intake level of a nutrient is enough to require new FDA notification and approval! So merely increasing the level of omega-3s in a supplement will require a manufacturer to seek a new approval from the FDA. Also note: All products made with ingredients that are not APPROVED by the FDA under these new rules will be called ADULTERATED. The FDA has a long history of engaging in armed raids against companies that it accuses of selling “adulterated” products (http://www.naturalnews.com/021791.html). Owners of these companies will be hunted down like common criminals and accused of “dealing drugs” — a label that can earn them a red flag on Interpol (http://www.naturalnews.com/027750_G…). This is exactly what happened to Greg Caton, who was kidnapped from Ecuador by the FDA after manufacturing and selling anti-cancer salves that actually worked quite well to eliminate skin cancer tumors. Caton’s listing on Interpol said he was wanted for “drugs, related crimes, fraud.” That’s the official Interpol listing. What drugs? The skin cancer salves. What fraud? The “fraud” of selling anti-cancer products. What “related crimes?” The “crime” of refusing to bow down to the FDA’s outrageous censorship and tyranny. In this way, the FDA can simply fabricate fictitious accusations against sellers of nutrients and herbs, then use either U.S. marshals to arrest them at gunpoint in the USA, or invoke Interpol to have them kidnapped from other countries, in complete violation of expatriation agreements between nations. 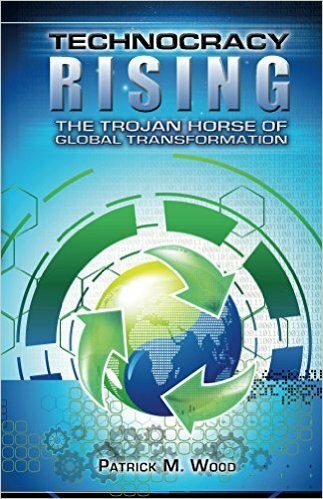 • The complete wipeout of nearly all nutritional supplement companies in the USA. • The bankruptcy of most health food stores and vitamin retailers, including online retailers. • A loss of millions of jobs currently supported by the supplements industry. How does this come to millions of jobs? Add up all the jobs related to the importing, manufacturing and transportation of nutritional supplements and superfoods. Include all the jobs related to marketing, advertising, promoting, distributing and publicizing these supplements. Then include all the jobs of workers in health food stores, fulfillment centers and supplement formulators. On top of that, you have all the jobs which are supported by successful nutritional supplement companies, including accounting, legal, graphic design and technology jobs. The Natural Products Foundation conservatively says that dietary supplements contribute $61 billion to the U.S. economy and support 450,000 jobs (http://naturalproductsfoundation.or...). The FDA’s new regulations, however, impact not just dietary supplements but also superfoods and functional foods which are part of an even larger market. In all, millions of jobs will be impacted by the FDA’s proposed new regulations. In addition, nutritional supplements boost job performance across all industries because they help employees work better and reduce sick days. So removing their access to these supplements will suppress the productivity of workers across ALL industries. This is one of the ways in which these proposed new regulations could destroy millions of jobs across the U.S. economy. • Skyrocketing rates of chronic degenerative diseases such as cancer, heart disease, diabetes and Alzheimer’s disease, because nutritional supplements are practically the only thing keeping these diseases in check right now. • Huge increases in health care costs due to more patients having more disease and yet having fewer alternatives available for preventing or treating that disease. Because of these reasons, I believe this FDA regulation, if fully enforced, would destroy what remains of America’s economy and, within just a few years, cause a total collapse of the health care system which is already burdened under a rising wave of degenerative disease (diabetes rates have doubled in just one generation, thanks to the utter failure of western medicine). In this proposed FDA regulation, I believe we are looking at a deliberate effort to destroy America, engineered by the unelected criminals and tyrants who run the FDA and answer to no one. They are writing their own new laws, in essence, with zero oversight from Congress and no responsibility whatsoever to the People they are supposed to serve. This is what happens when we allow runaway Big Government to trash our economies, mandate failed health care treatments (Obamacare) and nullify the U.S. Constitution. Obama says he is not engaged in a war against Libya (yeah, right! 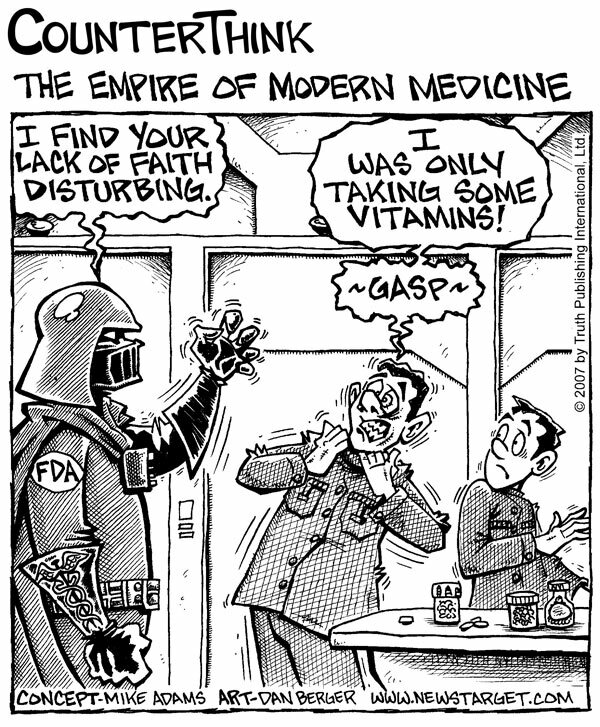 ), but it’s clear the FDA has declared war on the American people. And where does the FDA even claim it has the right to deny the use of dietary ingredients? The Commerce Clause, of course! It’s the catch-all clause that Big Government always uses to claim supreme power over the people. And yet it’s all a misinterpretation of the original intent of the Commerce Clause! The U.S. Constitution was written to LIMIT the power of government in order to protect the People from precisely the kind of tyranny being unleashed against us by the FDA. You can find even more info at the link to the article above. This nightmare ( our new reality ) is really getting to me! This has become the nightmare that never ends……it only gets darker and more bleak with each new turn in a, seemingly, endless tunnel of shadow and dankness. We have come to see clearly, the enemy…..our own government. But, then, of course, we have no real government……we have bought off thugs who represent themselves and not the constituents they are paid to represent and support by the laws of the Constitution. Why are we paying taxes for misrepresentation? Why are we allowing a dictator to sit in the White House? Why are we paying the salaries of this, most obscene group of traitors who call themselves Congess? As a natural healthcare practitioner, I’ve seen this coming……….it is not just an unfortunate thing……it is an EVIL thing. Lets call it the way it is…..we are NOT running under the Constitution of the United States……The Dictator in Chief is running things under the United Nations Charter….The One World Government and they are after complete control of our water and food supplies as well as controlling our heath decisions. The most simply put way of saying it…..they are in the early stages of genicide. Our seeds have been tampered with…..our food supply is controlled…..they are after our land….our water…..they manipulate our weather and have screwed up our economy. Does anyone out there really believe that we can or should trust our government? Well, I hope I wasn’t too harsh…….. NOT!! People need to hear it!!! Their only mistake was to move up the timetable; not enough of the older population has died off for them to just roll over the rest. LHA, you are not too harsh at all. Your post is an understatement. We are SO totally screwed. You are so right DT. THEY are running scared as more are awakened everyday and THEY are pushing up the schedule in an attempt to gain total control. Problem is that the people ARE WAKING UP and THEY are running out of time!!! (thanks to the work of hundreds if not thousands of patriots like you). As the total control agenda is accelerating, so is the awareness. As the police state is set up, people are preparing to take it down. As you stated, another problem is that those awake are not dying off as fast as THEY hoped, causing THEIR fear and uncontrolled acceleration. The more THEY push, the more awaken. Anything “natural” is evil and anything evil is “natural” in this Orwellian nightmare that we find ourselves in. War is peace and evil is good. Our only defense at this point is to continue our education on reality and the dissemination of this knowledge. As our money is devalued and we sink further into designed poverty, and as our food, air, and water is poisoned and we sink further into designed illness and early death, THEY only stiffen the will of those awake and give us the fuel to awaken others. Mankind is not as hopeless as THEY would wish. PM, encouraging words. Hope you’re right. I do know that, since the installment of this brain dead POSeur, more Americans than ever before have been awakened to the evil corruption and greed that have hijacked our nation, our Constitution and our ethos. It is possible that they will not be able to beat back the millions that are now onto them; at this point, anything is possible. I pray daily for our safety and freedom, even as the perpetrators work overtime to divest us of every last remnent thereof. Still, I think it may well be time to move.